If you were to non-verbally depict the emotion of grief, I would assume many would strike a pose of head in your hands. This simple gesture I found in countless photographs and paintings as I searched for this weeks art collection of pieces with the title "Grief". I tried to find less traditional images, however, I've always liked this oil painting by Gene Gould, "Grief" (c1965). Though with that same pose, it conveys much with the colors used and the drips of paint. With similar color scheme and graphic representation of body posturing is this piece to the right by Gustave Miller entitled "Grief". Both of these imply a solitary grief, but consoling and shared grief is also important. I found an artist named Linda Branch Dunn who keeps a website of her pieces. She works mostly with fabrics. This was an interesting look at an artist's work in progress. 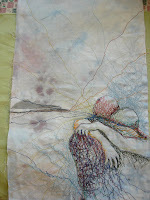 The first photo to the left is a fabric piece entitled "Grief" (2007), depicting 2 people in embrace. She mentions being inspired by a photo after a bombing. Click on the image to see the exquisite detail of the stitching. 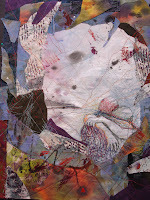 What is interesting is that she mentions just framing it, but then changes course, as she adds much more color and fabric, leading to a different piece, the title changing to "Fractured" (2007). I find the pieces completely different, even though you still see the original in Fractured. Which one do you like better? 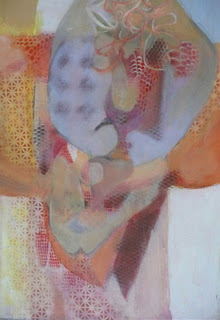 Moving into a bit more abstract is this piece by Pat Goslee, a mixed media on paper called "Grief Underneath" (2008). The impression the piece leaves me with is that of someone, again head down, clutching their gut. However, as is the case with more abstract works, you may see something completely different. The color scheme is less gloomy the the first 2 pieces. For the sculpture contribution to this gallery edition, I've chosen the work by Henri Laurens (1885-1954) called "Le Douleur (Grief)". 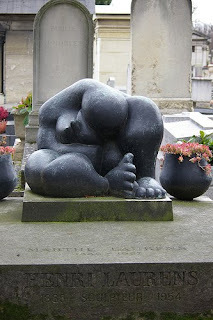 What is ironic is that it adorns the grave of it's creator in Paris. Did Henri have in mind his own death as he worked on the piece? Perhaps it was anticipatory grief, a phenomenon we talk of often in palliative medicine. Again the figure hunches inward, grasping what seems to be a pillow. The common theme of most of the works does seem to be physically posturing inward. Is that because emotionally grief brings us inward? If you like these gallery posts do check out the previous installments of "Last Breath", "Pain", "Afterlife", "Restless", and "Stillness". Fabulous post as always, Amy! It is a wonderful reminder to us all on how to express the grief. So often we internalize to that our own bodies cannot recognize themselves or purge the contents within. Reminding us that communicating through art, not only for ourselves in grief, but for others to " feel" our emotion without words is healing.